With nearly eight weeks until the end of the year, 2017 has already earned a bitter honor. With nearly eight weeks until the end of the year, 2017 has already earned a bitter honor: It is the most deadly year for mass killings in the U.S. in more than a decade. Sunday’s shooting at First Baptist Church of Sutherland Springs, Texas, which killed 26 people, raised the total of victims lost in mass killings this year to 208, according to USA TODAY data. The runner-up: 2016, which saw 188 people lost in such attacks. Since 2006, USA TODAY has tracked a total of 358 mass killings that have claimed the lives of 1,883 people. The cases include shootings, stabbings, fires and blunt-force attacks, among others, in 45 states and the District of Columbia. They date back to a Jan. 1, 2006, stabbing in Richmond, Va., that killed four people, and end, for the moment, with Sunday’s horrific attack on the Texas church. The past two years have not offered encouraging news: Three of the five largest killings — in Sutherland Springs, Las Vegas and Orlando, Fla. — have taken place since June 2016, the data show. Taken together, the three large attacks have claimed 133 lives. For its database, USA TODAY examined FBI data, which defines a mass killing as one claiming four or more victims, not including the perpetrator or perpetrators. 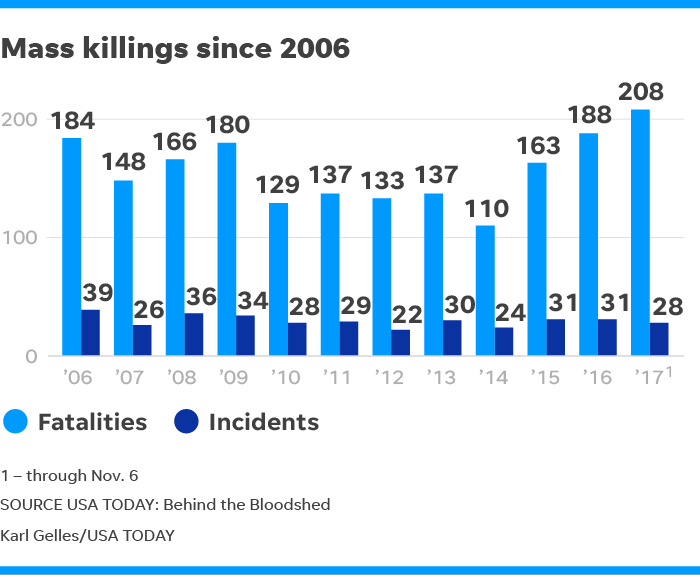 USA TODAY also examined local police records and media reports and found that mass killings happen far more often than the government reports. Firearms are most often used — the USA TODAY statistics found that 77% of mass killings involve a gun — but killers use whatever is available, from their hands to saws to baseball bats and fire. About one in three killers does not leave the scene alive. One in four commits suicide, while others die at the hands of police. Still more are deemed incompetent due to mental illness. On average, USA TODAY found, mass killings take place about once every two weeks. Though large public killings, like those in Sutherland Springs, Las Vegas, Orlando, San Bernardino, Calif., and Newtown, Conn., earn headlines and national attention, the data reveal that these account for only about one in five mass killings. Most are domestic disputes gone horribly wrong: The majority of cases are breakups, estrangements and family arguments that turn violent, the data show, often in the home. Just 19% of mass killings take place in public. About 57% of victims know their killer, even if they aren’t the main target. One in four is a close family member: a spouse, sibling, parent or child. Nearly one in three is under 18. Police investigating Sunday’s shooting said gunman Devin Kelley, 26, entered the church late Sunday morning dressed in black tactical gear, walked down the church’s center aisle and began "shooting on his way back out," Wilson County Sheriff Joe D. Tackitt Jr. said. Freeman Martin of the Texas Department of Public Safety said Kelley's mother-in-law had previously attended services at the church, but was not there during Sunday's attack. Martin said Kelley had sent threatening text messages to his mother-in-law; he noted that there was "a domestic situation going on within this family." The shooting, Martin said, "was not racially motivated; it wasn't over religious beliefs." Kelley was court-martialed in 2012 for assaulting his spouse and their child, receiving a bad conduct discharge from the Air Force and 12 months of confinement, Air Force officials said.